The afterlife of silent films has lasted much longer than anyone would have predicted in 1930, the year most industry people declared the medium dead. In transitioning from commercial product to historicized, aesthetic object, silent film has survived more than eighty years and there is little reason to doubt that it will not continue to survive. Today, silent films are alive and well, preserved in archives, screened at “silent film festivals” in San Francisco, Pordenone, and other venues, often with live music, and available on dvd and other electronic media, even if they are a niche market. The transition away from silent cinema to “the talkies” was also never as instantaneous, as many believed; film historians, like Rick Altman, Douglas Gomery, Donald Crafton, and Scott Eyman, have documented not only the actual transition to the new medium, as well as the long history of sound film technologies, going back to at least 1903. 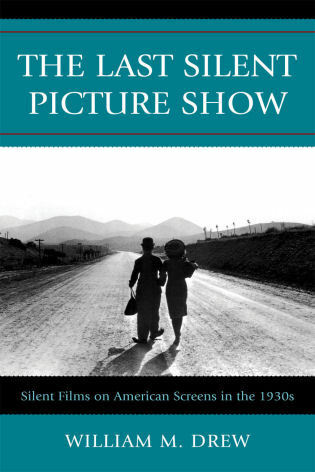 As William Drew’s book, The Last Picture Show, points out, attempts to revive silent films commercially, continued well into the 1930s and even into the 1940s, although individual efforts were usually short-lived, their cumulative, long-term effect of establishing silent cinema’s afterlife. Drew begins by arguing that once Hollywood producers embraced sound films, the American film industry framed any silent film production under the guise of “old time movies,” whether reissues or premieres, as an antiquated and obsolete historical medium, eliciting in audiences only derision and mirth. With that industry politique, silent films entered institutionally into the recently conceptualized realm of film history, necessitating the founding of a film historical infrastructure, including film archives in which old films were to be preserved, alternative screening spaces where silent films could be shown, and academic film history courses, where silent films could be discussed. These linkages are not new to film historians, but Drew’s assertion that there existed an industry conspiracy to deride silent films is original. As early as 1921, commercial cinemas began featuring “old time movie shows” (mostly films from the teens, but also shorts from the first two decades, as second features, when new full-length films premiered. By 1930, industry spokespersons rallied against any attempts to revive silent films as a viable film production model by consistently denigrating films which featured pantomime as archaic. As a result, Drew argues, such new silent features as The Silent Enemy (USA 1930), Chaplin’s City Lights (USA 1931), and F.W. Murnau’s Tabu (USA 1931) were relegated to the margins of the market, even though initial public reaction and box office for these films was exceedingly positive: City Lights, for example, became one of the top grossing films of the year. Quoting numerous film reviews in large and small newspapers, Drew notes that film critics were divided on the issue: “This last comment was indicative of the bifurcated nature of much film criticism in that period with partisans of the talkies dismissing silents as outmoded while champions of the vanishing medium… represented the arrival of sound as a backward step in aesthetics.” (p. 27) Drew is of course right to tease out this dichotomy in the mainstream film press, but he could have strengthened his argument by referencing the intense debate within the international film community about the coming of sound, whether in film theoretical works, film journals or industry publications. In lieu of that kind of contextualization via published film historical literature, Drew does deliver exhaustive and rather unique surveys of the American press. In the following chapter, Drew discusses Hollywood’s strategy to revitalize certain silent film classics by adding orchestral tracks and sound effects to their re-releases, just as they had sonorized silent films made in the initial transition period between 1928 and 1930. Thus, Triangle rereleased D.W. Griffith’s Birth of a Nation (USA 1915), Griffith himself released a sound version of Way Down East (USA 1920), and MGM sent The Big Parade (USA 1925) and Ben Hur (USA 1925) back into the cinemas. Interestingly, the focus of studio publicity was on the sound effects and music, rather than on the film’s original cinematic quality, again privileging sound technology over silent film’s visual aesthetics. And while all the films recouped their investment, there were only a few other isolated attempts to release silents, including the rerelease of Valentino’s Sheik films in 1938 (subject of a later chapter), because by the late 1930s most film critics felt the films were too melodramatic, now that synchronized sound emphasized realism. The studios even withdrew from circulation, many silents with orchestral tracks from the late 1920s. In the subsequent chapter, Drew discusses the slow transition to sound in the non-electrified Hinterlands of North America and in the electrified, but poor working class neighborhoods of urban America, the “Little Theatre” movement, and the 16mm home market, all safe havens for silent cinema. He then discusses Mary Pickford’s scandalous decision to destroy all her early films (later rescinded), and Chaplin’s production of Modern Times (USA 1936), as two different reactions to the perceived negative status of silent cinema. The substantial American reception of the Soviet Russian silent classics in the 1930s and the much more modest impact of Japanese and Chinese films (which remained silent at least until 1936), furthered through cultural organizations, art cinemas, and 16mm distribution, covers two more chapters. Next, Drew retells the previously well-documented establishment of the Museum of Modern Art and its efforts on behalf of silent cinema distribution to film societies. But Drew also critiques Iris Barry’s canonization of European cinema over American and MOMA’s initial policy of allowing audiences to turn serious silent film screenings into laugh fests. Drew concludes with a chapter that discusses further revivals of silent films in the 1940s and forward, culminating in the modern revival of silent film culture with live orchestras, after Francis Ford Coppola’s release of Kevin Brownlow’s reconstruction of Abel Gance’s Napoleon in 1981. Published by the quasi vanity press, Scarecrow, The Last Picture Show is the work of a dedicated amateur film historian, which is both its strength and weakness. As a study of silent film’s afterlife as reflected in the mainstream American press, Drew brings together a number of previously isolated phenomena and the little discussed points of view from small-town America. Remaining singularly focused on this one source, he discovers some gems, like Kirk Bond’s “Lament for the Cinema Dead,” a passionate plea for film preservation, published in 1934. Drew, however, also strings countless film reviews together, often quoting extended passages, as if the mass of detail automatically increased historical veracity. Furthermore, by completely ignoring published film histories and non-journalist sources, the author’s analysis remains descriptive, often superficial, and lacking any theoretical basis. Drew’s central thesis that the industry willfully suppressed silent film could have also benefitted from the moderation provided by additional references. Finally, it seems curious that Drew almost completely ignores the role film collectors have played over the past eighty years in keeping the experience of silent film viewing alive, whether in their basement projection rooms or at the many cinephile conventions that persist to this day. Drew does discuss John Hampton’s film collecting in connection with his now infamous Silent Movie Theater on Fairfax in West Hollywood, but the collecting and preservation efforts of James Card, William K. Everson, David Bradley, Alex Gordon, and many others go unmentioned, as does the fact that Hampton’s collection is now being preserved at UCLA Film & Television Archive. Everson’s screenings from the 1950s through the 1980s in his New York flat were legendary, as were those of Henri Langlois in Paris, another film collector. Everson, of course, also taught silent film history for years at New York University and authored several classic silent film histories. Many of these private film collections have now gone to public film archives, thus further guaranteeing silent film’s afterlife. Unfortunately, until quite recently, film collectors were an extremely secretive bunch, and therefore anything but visible in the mainstream press.